2014 Honda CRF50F. Picture credits - Honda. Submit more pictures. 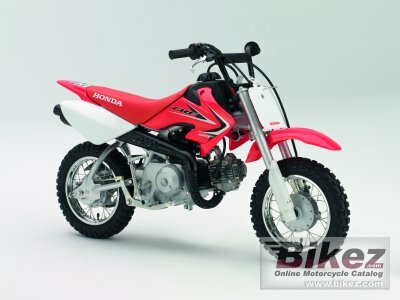 There�s a good reason Honda�s CRF50F is probably the world�s most popular beginner bike. A whole bunch of great reasons, actually. First, its bulletproof engine develops the kind of smooth, easy-to-use power first-timers really need. Its three-speed transmission with automatic clutch is newbie-friendly, and its tough suspension stands up to the use (and abuse!) of first-time riders. Price as new (MSRP): US$ 1399. Prices depend on country, taxes, accessories, etc. Ask questions Join the 14 Honda CRF50F discussion group or the general Honda discussion group.